Huddersfield striker Jordan Rhodes scored twice as his side beat Stockport in the first round of the Carling Cup. Rhodes drilled a loose ball into the net from 20 yards to open the scoring. His second goal came after he had a header ruled out for offside - an error from the resulting free-kick allowing him to curl home from 20 yards. Theo Robinson's superb solo effort made sure of victory for the Terriers, although County substitute Adam Griffin hit a late consolation with a low shot. "First half we played football but we played too much without any end product and overcomplicated things at times. "I thought certainly in the second half some of the football was of the highest quality the only blip was the goal at the end. "We need to start keeping more clean sheets than we have because I don't like conceding cheap goals." 90:00+3:29 The game is over, as the referee blows his whistle. 90:00+2:25 Lionel Ainsworth decides to take the corner short. 89:41 Joe Skarz challenges Danny Pilkington unfairly and gives away a free kick. Johnny Mullins restarts play with the free kick. 89:18 Shot from outside the box by Theo Robinson misses to the left of the target. 88:35 The official flags Peter Thompson offside. Direct free kick taken by Alex Smithies. 87:20 The assist for the goal came from Danny Pilkington. 87:20 GOAL - David Poole:Huddersfield 3 - 1 Stockport David Poole fires in a goal from inside the penalty area to the bottom right corner of the goal. 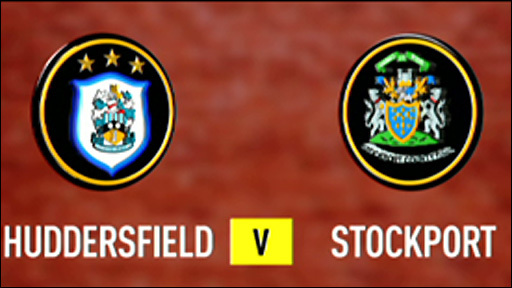 Huddersfield 3-1 Stockport. 84:22 Outswinging corner taken from the right by-line by Lionel Ainsworth, clearance by Michael Raynes. 84:02 Robbie Simpson produces a drilled right-footed shot from 6 yards. Save made by Paul Gerrard. 83:04 Effort by Greg Tansey from a long way out goes over the target. 82:38 James Vincent concedes a free kick for a foul on Tom Clarke. Antony Kay takes the direct free kick. 81:56 Headed effort from deep inside the area by Lionel Ainsworth misses to the left of the goal. 78:38 Substitution Lionel Ainsworth comes on in place of Gary Roberts. 77:14 Antony Kay takes the direct free kick. 77:14 Substitution Carl Baker goes off and Adam Griffin comes on. 77:14 Foul by Carl Baker on Antony Kay, free kick awarded. 75:54 Substitution Robbie Simpson replaces Jordan Rhodes. 75:54 Effort from inside the area by Jordan Rhodes misses to the left of the target. 73:55 Assist on the goal came from Jordan Rhodes. 73:55 GOAL - Theo Robinson:Huddersfield 3 - 0 Stockport Goal scored by Theo Robinson from deep inside the penalty area to the bottom left corner of the goal. Huddersfield 3-0 Stockport. 70:13 Substitution (Huddersfield) makes a substitution, with Theo Robinson coming on for Lee Novak. 69:51 Substitution Paul Turnbull goes off and James Vincent comes on. 69:23 Substitution (Stockport) makes a substitution, with Danny Pilkington coming on for Oli Johnson. 67:14 Michael Raynes takes a shot. Clearance made by Lee Peltier. Inswinging corner taken from the right by-line by Michael Rose, Joe Skarz makes a clearance. 65:23 David Poole takes a inswinging corner from the left by-line to the near post, clearance made by Antony Kay. 64:58 Drilled left-footed shot by Oli Johnson. Peter Clarke manages to make a clearance. 63:42 Peter Thompson has an effort at goal from 12 yards. Comfortable save by Alex Smithies. 62:26 Inswinging corner taken by Anthony Pilkington from the left by-line. 60:19 Inswinging corner taken by Gary Roberts from the right by-line. 56:47 Effort from the edge of the area by Antony Kay goes wide of the right-hand upright. 55:51 Tom Clarke takes the chance to get an effort at goal. Comfortable save by Paul Gerrard. 53:32 Corner taken left-footed by Gary Roberts, Gianluca Havern manages to make a clearance. 53:18 Shot by Anthony Pilkington. Blocked by Michael Raynes. 52:43 Free kick awarded for a foul by Peter Thompson on Nathan Clarke. Alex Smithies takes the free kick. 51:21 Antony Kay takes a shot from long range which goes wide of the right-hand upright. 49:50 The offside flag is raised against Oli Johnson. Alex Smithies restarts play with the free kick. 47:03 Assist on the goal came from Lee Novak. 47:03 GOAL - Jordan Rhodes:Huddersfield 2 - 0 Stockport Jordan Rhodes fires in a goal from the edge of the penalty box to the top right corner of the goal. Huddersfield 2-0 Stockport. 46:07 Free kick awarded for an unfair challenge on Lee Novak by Michael Raynes. Antony Kay takes the free kick. 45:34 Jordan Rhodes is ruled offside. Paul Gerrard takes the free kick. 45:00+2:18 The players leave the pitch at half time. 44:59 GOAL - Jordan Rhodes:Huddersfield 1 - 0 Stockport Goal scored by Jordan Rhodes from just inside the penalty area to the bottom right corner of the goal. Huddersfield 1-0 Stockport. 40:10 Jordan Rhodes is flagged offside by the assistant referee. Free kick taken by Paul Gerrard. 35:59 Corner taken by David Poole from the left by-line, Lee Peltier makes a clearance. 34:10 Anthony Pilkington takes a shot. Michael Rose gets a block in. Inswinging corner taken right-footed by Antony Kay from the left by-line, Michael Raynes makes a clearance. 31:49 Antony Kay takes a shot from inside the box clearing the bar. 30:33 Corner taken right-footed by David Poole from the left by-line, save by Alex Smithies. 29:20 Gary Roberts concedes a free kick for a foul on David Poole. Strike on goal comes in from Greg Tansey from the free kick, save by Alex Smithies. 28:24 Lee Peltier concedes a free kick for a foul on Carl Baker. Michael Rose restarts play with the free kick. 26:02 Corner taken right-footed by Greg Tansey from the left by-line to the near post, Alex Smithies makes a save. 25:25 Foul by Nathan Clarke on Peter Thompson, free kick awarded. Greg Tansey crosses the ball from the free kick right-footed from left channel, clearance made by Nathan Clarke. 22:49 Unfair challenge on Johnny Mullins by Jordan Rhodes results in a free kick. Johnny Mullins takes the direct free kick. 17:36 Unfair challenge on Anthony Pilkington by Carl Baker results in a free kick. Tom Clarke restarts play with the free kick. 15:25 Antony Kay produces a drilled left-footed shot from 35 yards and went wide right of the net. 14:34 Effort by Tom Clarke from a long way out goes over the crossbar. 9:17 Inswinging corner taken by Michael Rose, clearance by Antony Kay. 8:43 Corner taken left-footed by Michael Rose to the near post, Peter Clarke makes a clearance. 8:18 Free kick awarded for an unfair challenge on Oli Johnson by Tom Clarke. Paul Turnbull crosses the ball in from the free kick, clearance by Peter Clarke. 4:56 Anthony Pilkington has a headed effort at goal from deep inside the area missing to the right of the target.